With Sebastian Vettel on pole at Singapore, it wasn't much of a surprise that it was the Red Bull driver who would win the race. And win he did with tremendous flair and style. It was only over the first two corners that his lead looked like it would be threatened, with Nico Rosberg getting alongside the Red Bull and looking like he might be able to move into the race lead. That, of course, didn't last very long. Vettel smartly took back what was his, and set about running away at the head of the order. There was no stopping him after that. As it so often happens when Vettel is at the head of the order, it was the racing action behind him that was truly interesting. The start of the race clearly went to Fernando Alonso, who put his foot down and catapulted himself into third place on the grid, despite starting seventh, chasing after Rosberg's Mercedes. Romain Grosjean had dropped places though, unable to retain his third place grid position for too long. The other Lotus of Kimi Raikkonen started down in 13th place. Raikkonen could have been in better shape, too, suffering from a bad back. That didn't stop him from making up positions and moving into 10th place before the first round of pitstops. 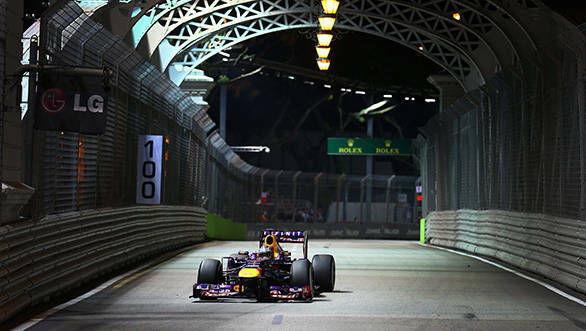 Singapore, once again, proved to be a challenge as far as tyre wear was concerned. But if there was one car that wasn't fazed at all, it was the Red Bull of Sebastian Vettel. While the rest of the field struggled here and there, Vettel was still comfortably motoring along at the head of the grid. Rosberg still followed, with Alonso running steadily in third. Keeping in tradition with the Safety Car coming out at Singapore, the 2013 edition was no different. When Daniel Ricciardo went into the wall at Turn 18. Bernd Maylander's services were called for, and the field slowed down, following the SC and reforming order behind it. At the restart of the race, it wasn't as though drivers were able to take advantage of the situation to move up the order. Vettel sped off into the distance once again, and the following pack stayed as was. There were more casualties during the race, with Romain Grosjean's Lotus suffering an air consumption problem on Lap 34, that would eventually send the car into retirement. Kimi Raikkonen too was complaining of trouble on his car, but was steadily making his way up the order. Alonso was running in second, with Jenson Button running third for McLaren. But there was only so long that Button could hang on to third. Raikkonen made a scything move to take the final place on the rostrum, and Mark Webber began attacking Button as well. Webber's race went up in flame, though, when his engine blew up on the last lap. So it was Vettel, Alonso and Raikkonen that made up the top three at Singapore. After the race, Webber was reprimanded for being given a lift back to the pits on Alonso's Ferrari. Given that it was his third reprimand this season, he now gets a ten-place grid penalty at the Korean GP. Reckon Webber's glad he's done with F1 for good, soon! Yes, so Vettel won another race this season. But our hero of the GP was Kimi Raikkonen. Thirteenth to third with a bad back. Good stuff!